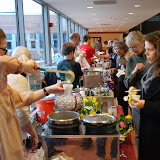 The 6th Annual Hunterdon County Rotary Soup Cook-Off, held on February 25, 2013, was the most successful in the event’s history. Twenty restaurants competed, more than 800 attendees sampled and voted for the County’s best soup, and more than $10,000 was raised and donated directly to the County’s five food pantries. Judges Pick: Matt’s Red Rooster Grill for their Apple Wood Smoked Bacon, Potato and Corn Chowder. 1st Place (Popular Vote): Mountain View Chalet for their Italian Wedding Soup. 2nd Place (Tie for Popular Vote): Hunterdon Medical Center for their Creamy Wild Mushroom Soup. 2nd Place (Tie for Popular Vote): Ye Olde Sub Base for their Beer Cheese Soup. 3rd Place (Popular Vote): 55 Main for their Crab Chowder.